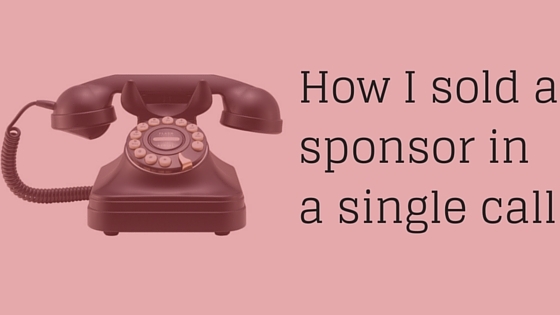 Guest Post: How I Sold a Sponsor in a Single Call | What Gives??? This blog is a response to the blog: “How I Was Sold By a Fundraiser In a Single Phone Call” – which is definitely worth reading. Event sponsorships are not my favourite thing. In fact, I really dislike them. Set “Gold, Silver, Bronze” levels – all based on how much money the charity needs – the exact opposite of #DonorLove if you ask me. “This approach to corporate giving is refreshing and effective! asked questions about our business goals and listened. used those goals to build a compelling sponsorship proposal that was a no-brainer to fund! Rather than be stuck with our logo in a booklet that no one would look at, we ended up more than tripling our original goals for the sponsorship and forming some valuable partnerships along the way. STEP 1: Get to know THEM: The first step is to really learn about the company you want to work with. Go on their website, read how they talk about themselves. What services are they selling? What language do they use? Watch some commercials and look at some advertisements for the company and really get a sense of their brand. What are their biggest challenges today? What do they think they will be tomorrow? What are their Corporate Social Responsibility (CSR) goals and objectives? What have they liked about past non-profit partnerships? What has worked well? What hasn’t? What makes their company unique? Why do their customers choose them over their competitors? STEP 3: Make a donor-focused pitch: In your proposal, talk about THEM. Restate what you’ve learned about their CSR objectives and business needs, and clearly explain how the program you’ve identified matches their interests and helps THEM achieve their business objectives. Too often charities make pitches based on their cause and their organization. Focus more on the opportunity of the partnership – and less on your need for money. Do you want your corporate donors to LOVE the proposals you prepare for them? More importantly, do you want your corporate asks to be successful?! If you want to learn how to create better – more successful – more profitable corporate proposals then sign up for this webinar today! Only $24.99 CAD! Drawing from her experience in major and corporate giving Rory Green will look at how charities can do a better job of corporate fundraising – and how to engage in deeper, more meaningful, more PROFITABLE corporate partnerships. This webinar will use real life case studies, and give you the practical information you need to improve your corporate fundraising efforts! Sign up NOW and you will also get a REAL LIFE corporate proposal that got a “yes” in a day! Trust us, you do NOT miss this webinar. Sign up now – seats are limited! Can’t make the webinar live? No problem! Sign up now and receive a recording after the webinar is over, to watch whenever you like! This entry was posted in #DonorLove, Corporate Sponsorship, Events, Guest Blogger and tagged corporate sponsorship, event sponsorship, events, sponsors by Maeve Strathy. Bookmark the permalink.